Since I announced the challenge I have been thinking of what guidelines or “rules” should be imposed for this challenge. I want it to be fun but I also want it to push us out of our comfort zone, I would also really love to do some giveaways and competitions to get the community vibe really flowing (information on contests to come later so be sure to follow our Facebook page). This challenge is meant to get you thinking about the foods you are eating, to think about how those foods affect your body, and to get you to start listening to what your body is telling you. I also hope that some of the healthy habits we develop while on this 50 day challenge stick with you once the fun of a competition is over. So the moment I am sure you have all been waiting for has arrived, I present to you the rules. 1. Cut out the processed foods. For the next 50 days eliminate all the processed sugars, flours, high fructose corn syrups, and other foods that come in boxes and are generally associated with commercials. Fill your body with whole, fresh, organic (if possible it is optimal but we don’t want everyone to break the bank) foods. Focus on vegetables and fruits, whole grains, lean proteins and healthy fats and dairy. 2. Cut out the booze: Some of you might be totally disgusted by this rule, others it might not affect you all that much. But remember alcohol is FULL of empty calories, sugars, sulphites, artificial colours and flavours, although it might be nice to have a beer at the end of a long week, it is also a good idea to give our livers a break every now and again. 3. Do your best to eat 5-6 small meals a day. Each meal should contain a mixture of complex carbohydrates and protein. Be sure you are getting in your vegetables and fruits for your daily dose of vitamins minerals and fiber and remember to mix it up so you don’t get bored. Also key here is “smaller” even though you are eating healthier and more often it doesn’t mean you get a free pass to forget about portion sizes so be mindful. 4. Never skip breakfast. You want to get that metabolism going in the morning, be sure to make yourself a breakfast filled with delicious proteins and complex carbs and try and get it in your stomach within the first hour of waking up. 5. Don’t make yourself crazy. So this is a challenge yes but understanding that no one is perfect this challenge has incorporated 3 cheats. Now just because they are available doesn’t mean you have to use them so do your best to avoid using them but you have 3 if you feel you must. 6. Drink 2-3 litres of water a day. If this is challenging for you try to have some water with each of your meals throughout the day. Water helps keep our joints juiced up and keeps us moving, it also helps to remove toxins from our system, so be sure to drink up. 7. Be mindful of your drinks: cut out the sugary energy drinks, fruit juices, lattes, coffees filled with milk/cream and sugar. During the 50 days stick to the simpler things in life, water of course, green tea, clear herbal teas and black coffee. If you must have some juice just make sure you are making it at home to eliminate added sugars and preservatives. Now that we have some guidelines we can all start getting super stoked and pumped up about getting into this challenge. Although I will miss my Friday glass of wine, I am sure my body will be so much happier after I love on it with healthy and nutritious foods for 50 days. I am so excited to share with all of you. I hope you are all as excited as I am, and remember if you are cleaning out your fridge and pantry this weekend to take some before and afters and share them on Facebook or Twitter. Happy Friday everyone! Please let me know if you have any questions or if you would like me to touch on anything in a future post! 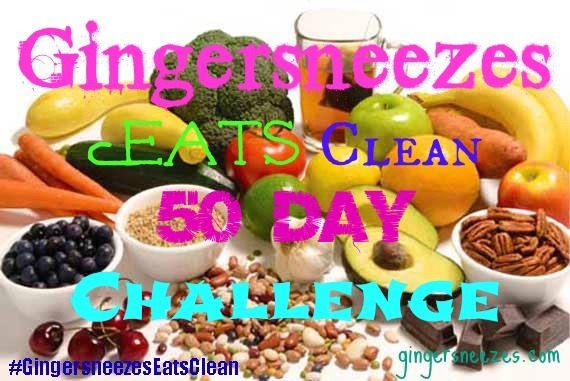 This entry was posted in General and tagged artificial colours, food, health, vegetables and fruits by healingginger. Bookmark the permalink. I would totally do this, but it would completely violate the “don’t make yourself crazy” rule. A year was enough for me! However, I am avoiding over-indulgence in processed foods. Best of luck!!! You did have a pretty comprehensive year so I guess you get a free pass. Hopefully we can share some tasty recipes with you. ok. I’ll give it a try, but does a soy latte no sugar come under coffee filled with milk/cream? Did you say somewhere that we should post what we eat every day? So the soy latte. There is nothing “wrong” say with one but if you aren’t making it yourself you might not know if the soy milk vein used is GMO free or if it is organic, and what other type of stuff is in it. I would really recommend sticking to black coffee or green/herbal tea for the challenge. For posting your food no you don’t have to post daily what you are eating. However if you find a great recipe and would like to share it please do! Either post it up on Facebook or send it over to me at gingersneezes02@gmail.com and I can put it up on your behalf. So excited to have you aboard. So excited to give this a try!!! I always love a good challenge!